Waterworks is a permanent water sculpture commissioned for a private garden in the mountains of Colorado. 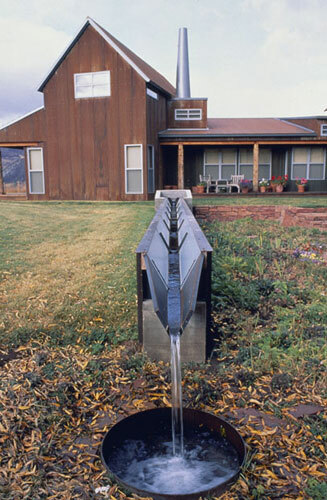 The forms and materials utilized in Waterworks reflect the vernacular forms and materials of agricultural irrigation structures used in the West. In the sculpture, water flows from a rectangular concrete basin, down a steel trough, into a circular hole, and then re-circulates through the sculpture. The 35 ft. long concrete-and-metal water wall also serves as an enclosure for the residence’s garden and patio.